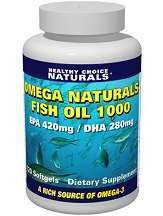 Basic Information: What is Omega Naturals Fish Oil 1000? Omega Naturals Fish Oil 1000 aims to offer all the benefits of a top quality Omega-3 supplement, such as to support healthy cardiovascular functions and the structure and function of cellular membranes. It is also stated that it may help with healthy brain development, cognitive functions, and healthy vision. Omega-3 oils are often associated with longevity, optimal health, and many dietary programs insist on including it in your diet. We have reviewed this product to help inform customers on whether this is an effective product or not. This product claims to be a highly concentrated Omega 3 fish oil supplement without containing any harmful fillers or toxins. The fish oil is obtained from wild sardines, anchovies, and mackerels that are harvested from deep Nordic sea waters which is less polluted, therefore making the supplement much purer and of better quality. This supplement contains 1000mg of pure fish oil per softgel capsule. This product boasts of having three times more EPA and DHA than other regular brands; containing 400mg of EPA and 300mg DPA per 1000mg capsule. However, we have found that there are products with higher potencies on the market. The recommended dosage for this supplement is one to two softgels a day, with meals. If you are pregnant, nursing, or have any pre-existing health conditions, it is advised to consult with your doctor before taking any supplement. Official distributors have made this product highly available for online purchase. The price is $18.90, marked down from $27.95, so saving you $9.05. The pack contains 120 softgels, which if taken as recommended, means this is a 3 to 4 month supply. No side effects are mentioned by the official distributors, and we have not found any reviews mentioning any. However, people who are allergic to fish should not take this product. This product may also contain traces of milk, soy, wheat, egg, peanuts, tree nuts and shellfish, so those with allergies should take this product with caution. If any alarming side effects occur, you should seek medical attention and stop using this product. This product is GMP certified, which guarantees a high level of quality. The manufacturer offers a 90-day money back guarantee on this product if you are at all unsatisfied. All you have to do to receive a refund is return the empty bottle or any unused portion of the product, no questions asked. This shows a good level of commitment by the manufacturer for their customers and confidence in their product. The fact that this product contains natural ingredients that are GMP certified is very positive. The impressive 90-day money back guarantee, no questions asked, is another quality that makes this product stand out. However, the potency of the fish oil per capsule and the levels of EPA and DHA are not the highest on the market. We were unable to find many reviews to see what consumers thinks of this product.